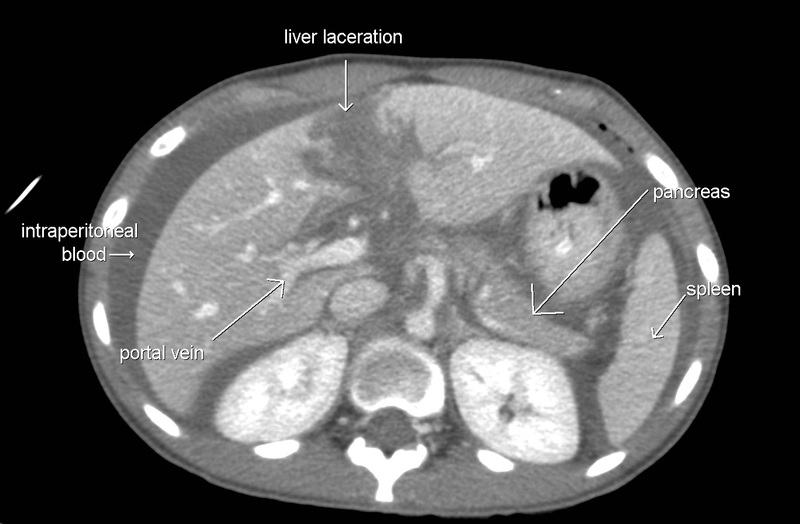 Image 2a (Computed Tomography): Traumatic laceration to the liver. Note extensive free intra-peritoneal blood. 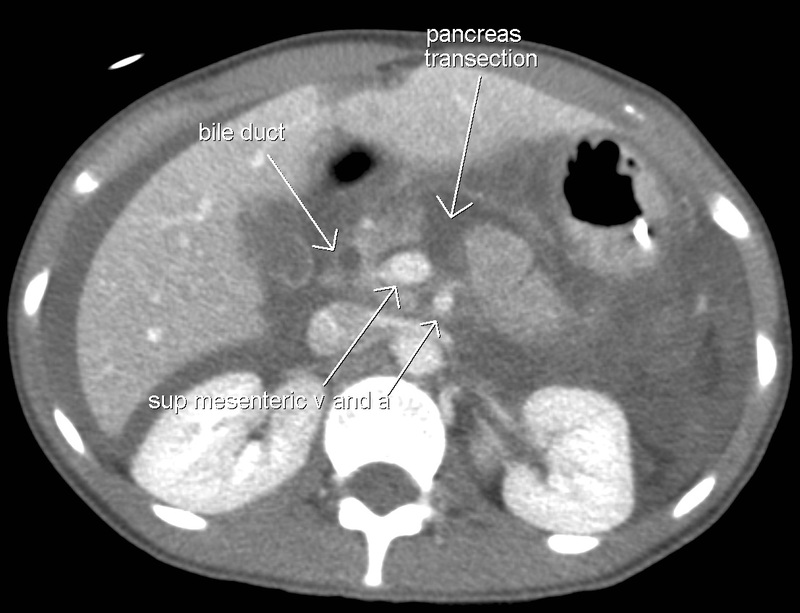 Image 2b (Computed Tomography): Traumatic laceration to the pancreas. Note extensive free intra-peritoneal blood. 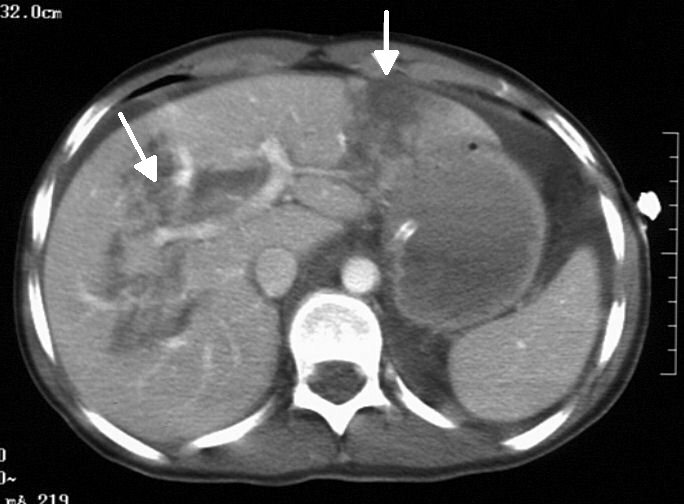 Image 3a and 3b (Computed Tomography): Coronal and axial views showing small bowel perforation with adjacent collection (arrow). Conventional CT of the abdomen/pelvis has a poor sensitivity of 50-60% for detecting blunt bladder injuries. 32,33 Its role in this setting is to identify other abdominal injuries. The accuracy of CT for detecting and categorising bladder injuries can be greatly improved with a CT cystogram. Should be considered if CT cystograms are equivocal for the diagnosis or categorisation of bladder rupture. EAST Practice Management Guidelines Work Group. Practice management guidelines for the nonoperative management of blunt injury to the liver and spleen. EAST practice management guidelines for trauma. 2000. 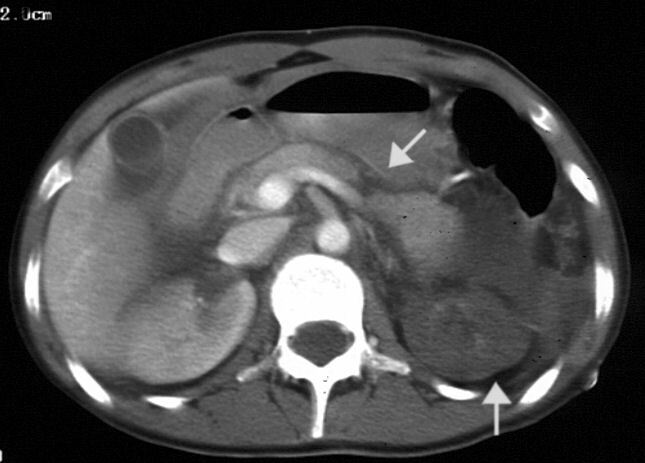 Becker CD, Mentha G. Blunt abdominal trauma in adults: role of CT in the diagnosis and management of visceral injuries. Part I: Liver and Spleen. Eur Radiol. 1998;8:553-62. Shuman WP. 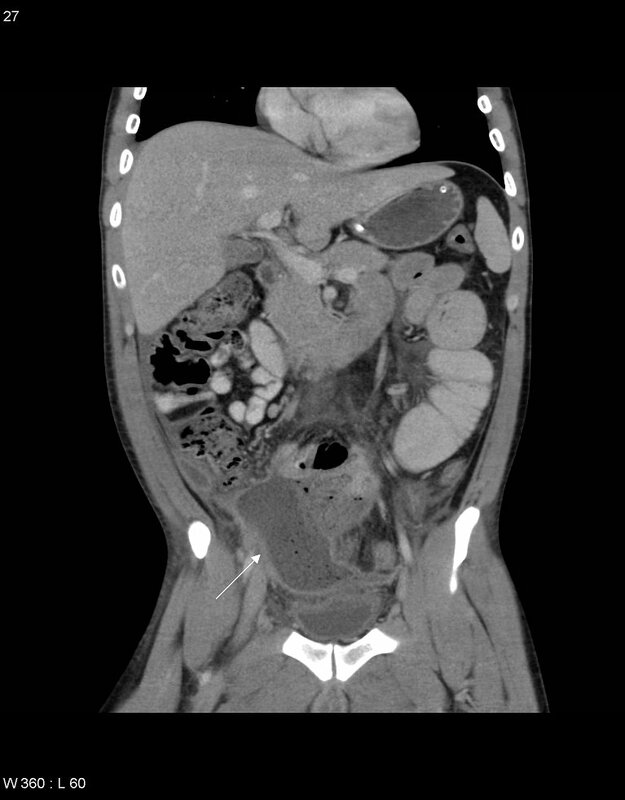 CT of blunt abdominal trauma in adults. Radiology. 1997;205(2):297-306. Becker CD, Mentha G, Schmidlin F, et al. 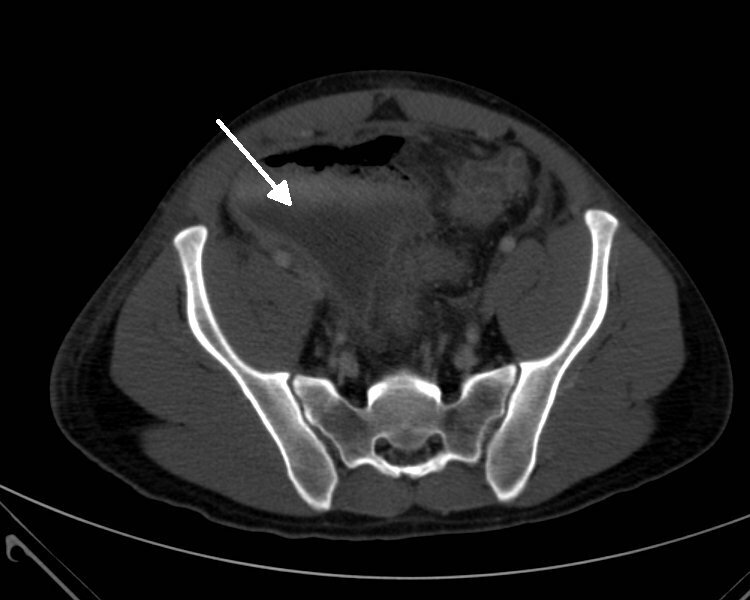 Blunt abdominal trauma in adults: role of CT in the diagnosis and management of visceral injuries. Part II: Gastrointestinal tract and retroperitoneal organs. Eur Radiol. 1998;8:772-80. Amoroso TA. Evaluation of the patient with blunt abdominal trauma: an evidence based approach. Emerg Med Clin North Am. 1999;17(1):63-75. Poletti P-A, Wintermark M, Schnyder P, et al. Traumatic injuries: role of imaging in the management of the polytrauma victim (conservative expectation). Eur Radiol. 2002;12:969-78. McGahan JP, Richards JR. Blunt abdominal trauma: the role of emergent sonography and a review of the literature. AJR Am J Roentgenol. 1999;172:897-903.